Tripadvisor.com has tons of information regarding hotels from all over the world, which can be used for monitoring prices of hotels in a locality, competitive pricing, analyzing how the price changes with each season, understand ratings of hotels in a city and lot more. Take a look at the screenshot below annotated with the data we will be extracting from Tripadvisor. Construct the search results page URL from TripAdvisor – Tripadvisor has complex URL for the search results page of each locality. For example here is the one for Boston https://www.tripadvisor.com/Hotels-g60745-Boston_Massachusetts-Hotels.html. We’ll have to construct this URL manually to scrape results from that page. We do that by getting this URL from Tripadvisor autocomplete API. Download HTML of the search result page using Python Requests – Quite easy, once you have the URL. We use python requests to download the entire HTML of this page. Parse the page using LXML – LXML lets you navigate the HTML Tree Structure using Xpaths. We have predefined the XPaths for the details we need in the code. The code is self-explanatory. We’ve added positional arguments in the command line scripts to specify check-in check-out date, locality and sort order for the results. You can download the code from here https://gist.github.com/scrapehero/1c425fdf290144cd4c7c635587feb459 if the embed above doesn’t work. Run it using python with arguments for the locality, sort order, check-in and check-out dates in YYYY/MM/DD format. 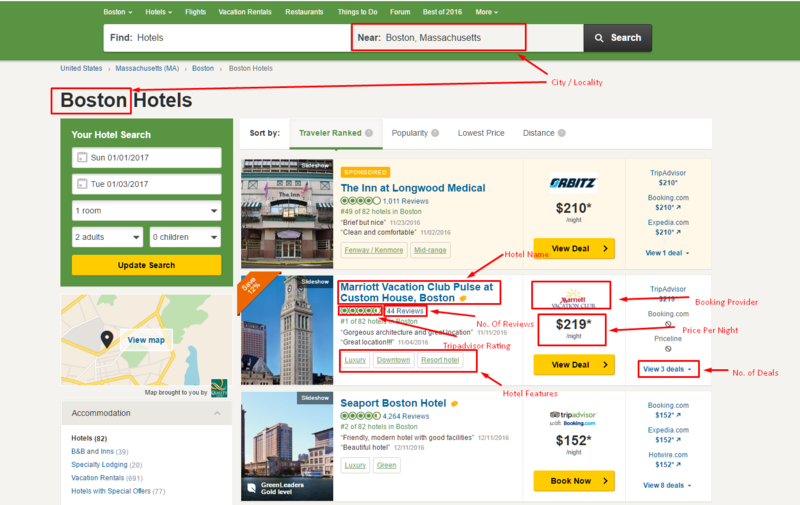 For an example – finding hotels in Boston for 2017-Jan-01 to 2017-Jan-02, sorted by popularity. python tripadvisor_scraper.py "2017/01/01" "2017/01/02" "popularity" "boston"
This will create a CSV file called tripadvisor_data.csv in the same folder as the script. Here is some sample data extracted from TripAdvisor for the command above. Let us know in comments how this scraper worked for you. This code should work for grabbing the first page of results for most cities. However, if you want to scrape for thousands of pages there are some important things you should be aware of and you can read about them at Scalable do-it-yourself scraping – How to build and run scrapers on a large scale and How to prevent getting blacklisted while scraping . If you need some professional help with scraping complex websites like TripAdvisor let us know by filling up the form below. Part 2 of our Tripadvisor Scraper - Learn how to extract hotel details such as hotel name, address, ranking and more from Tripadvisor using Python and LXML. Hi, how would we iterate the to the all pages and get the list of all hotels? In the above code when i yield the request the callback=self.parse is not getting called as the function is not called and it is only called at the end of the program. The original code doesn’t work with my system somehow and I have made below changes according to error info. Finally it works. Below are my summary, in case anyone has encountered the same error. SyntaxError: Missing parentheses in call to ‘print’. Did you mean print(“Scraper Inititated for Locality:%s”%locality)? Thanks for this, figured out the first one on my own but really thankful to have your help on the other too.